The area of Anini Beach is located on the north shore of Kauai. It is located off of Kuhio Highway down Anini Beach Road. There is no commercial area or town center. Anini is a beach community known for its tranquil stretch of beach made possible by Kauai’s largest coral reef. The reef creates sheltered lagoon areas that make it ideal for small children, snorkeling, fishing and learning such sports as wind surfing and stand up paddling. Anini Beach has restroom facilities, pavilions, showers and a small boat launch. (There is no lifeguard). It is legal to camp here six days of the week if you have a permit. Information for Permits can be found at Kauai Camping Permits. There are a number of beach houses on the beach and across from Anini Road. Although the area of Anini is not a Visitor Destination area (VDA) there are many grandfather legal vacation rental homes there. Because of it’s picturesque gorgeous setting, easy accessibility to the beach and limited amount of real estate, most properties in this area start at over a million dollars. 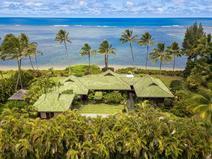 An interesting tibit: Hollywood’s Sylvester Stallone purchase oceanfront property in the 1990s in Anini Beach. He subdivided it and eventually sold the property.